I recently went to a doctor’s appointment with my husband. This physician specialist was said to be “one of the best” in his field so we made the appointment at the local Medical Center. But what I learned – was that they could have done a much better job managing the customer wait times. My husband’s appointment was scheduled for 1:30 pm. I was meeting him at the doctor’s office because I was coming from a business meeting. My business meeting went over so I raced down the highway because I didn’t want to be late for this appointment. To save time, I used the valet to park my car. I knew this would eliminate the need to wind my way through the garage looking for a parking space. I flew into the waiting room at approximately 1:33 pm and saw my husband sitting there so I was relieved that I had made it! Once in the waiting area we sat, and sat and sat there waiting to be called back to a room. My phone is a wonderful little gadget because it helps to distract me when I am stuck waiting on a service. However, after 35 minutes of waiting even my iPhone ran out of activities to keep me occupied. By this time I had caught up on my email, checked in on all my social platforms and even played a few games but at this point I was starting to get antsy. At 2:06 pm my husband went back to the receptionist and asked about the appointment and was told that we “were next”. Well that gave me hope that the wait was almost over. But that was not the case, we waited another 35 minutes before finally getting called back to the exam room. The nurse sheepishly apologized for the wait and when the doctor came in another 15 minutes later he apologized also. I appreciate that they at least acknowledged the wait. I only wish this doctor’s office was more proactive in communicating with the patients about the wait times. He was a great doctor in that he was kind, a good communicator and patient enough to answer all of our questions. I did like him but I don’t think that resolves the wait issue. I really do get it that a good doctor takes time with his patients and doesn’t let the clock dictate that sometimes critical communication process. However, what I don’t get is the process of not allowing for communication to those sitting in the waiting room – with Judge Judy playing on the television. Whether the business is a physicians practice, auto repair shop or hair salon – customers should be given the courtesy of communicating service delays. Delays happen, and that is OK. But those organizations that can figure out how to manage the wait times are the one who truly communicate care for the customer. Those who are picked to be on the front-line, are the ones who can help create a great customer experience. Employees should be trained and equipped to manage waiting customers, communicate information and resolve issues. An employee who is well trained can turn a negative customer experience into a positive one – simply because they know what to do. You can help the customer by simply setting the expectation of a wait. This simple step helps the customer psychologically prepare for the wait. It also gives them options. For instance, if we had been told that we would have an hour plus wait, we probably would have gone and gotten something to eat, taken a walk or gone next door to shop. It is only common courtesy to give people a heads up when the wait will be extra long. Things happen and delays are inevitable – and most customers are understanding and forgiving. But everyone’s time is valuable. Give the customer an idea about how long the wait will be, apologize for the delay and you will be showing respect for the customer and their time. Everyone appreciates a pleasant waiting environment. Reception areas and waiting rooms should be clean, well maintained and aesthetically pleasing. If someone is required to wait on a service they should at least have a comfortable place to sit. 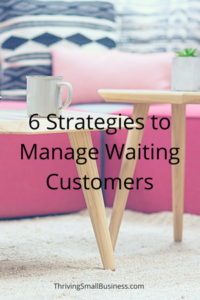 Crowded and noisy waiting rooms can agitate customers and not prepare them well for a good service experience. People don’t like to have to look for a seat and customers often “spread” out – so have plenty of seating. Make sure the waiting area is able to accommodate more people than would be waiting at any one time. The wait always feels shorter if there are distractions. Have you ever been in a line at Disney? They do a great job of distracting waiting customers. Waiting rooms typical use magazines and televisions as a distraction tool. If you choose this, make sure the magazines are current and that the television is on an appropriate channel for the clientele. My dentist does a great job with this in that they keep the TV on but have it muted with scrolling text on it, pleasant smelling candles lit and comfortable furniture to sit on. It is also a great idea to have activities for small children if kids are expected to be waiting with parents. My kids orthodontist had video games in the waiting room to distract the kids. As with any bad customer experience, employees should be equipped to perform service recovery and make things right for the customer. This can be as simple as a heart-felt apology to as complex as writing off part or all of a bill. For example, I’ve had restaurants write off a portion of the bill for long waits or poor food quality. Too often organizations get so wrapped up in “performing a service” that they lose sight of the service experience. Now might be a good time to assess your service through the eyes of the customer and make adjustments to ensure that they have an experience that not only meets their needs but exceeds their expectations.